Does Saving Get Easier As You Get Older? I read a report recently which said that in the US the old are getting richer and the young are getting poorer. The statistics in the report compared the difference in wealth between people under 35 and those over 65. Back in 1984 the older people were 10 times better off than the young ones. However, the difference has now increased to an incredible 47 times. Clearly there are a number of reasons for this difference but it got me thinking about whether or not saving gets easier as you get older. Do You Now Want Less? Let’s start off with a point you might not agree with. In my own experience, I can cast my mind back to the glorious days of the 1990s. Right Said Fred were, bizarrely, on top of the charts, Mr Blobby was omnipresent and a new World Cup disappointment was just around the corner. It was into this frankly confusing world that a younger version of me started work for the first time. Back then, I would eagerly wait for my humble monthly wage and agonise over what to spend it on. There were so many things I wanted because I owned very little. I wanted some new CDs, new baggy jeans, a new TV and so many other things. These days, I own more stuff so I want less. This might sound an overly simplistic way of seeing things but I would be interested to see if other people feel the same way. Of course, most of us earn more over time, which makes it easier to save as well. I still shake my head when I remember how I used to make something like £100 last me a month in my first job. I gave about half of it to my parents and in the first few months I had to invest in some work clothes from every salary, so that I could stop using my old school shirts and trousers to go to work in. This meant that my account was always empty each month long before the next wage came around. 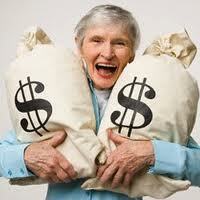 As we get older we have more commitments but I reckon that most of us have this compensated through a higher wage. The previous points don’t count for much if you haven’t made progress in your financial situation in the past. Ideally, you will start saving while you are young and make some smart investments which help you out in the future. However, there is also the possibility that you make bad decisions and don’t save as much as you should. If this is the case then you are probably going to find it harder to save as you get older, as you will be constantly try to make up for past mistakes. Do You Have More Expensive Tastes? Another point worth considering is how your taste evolves over the years. Maybe as a youngster you were happy eating chips out a bag but now you prefer to sit down in a classy restaurant for your meals. We all change in this respect over our lifetime but is it affecting your ability to save money? If it is then maybe it is time to consider whether going back to some of the simpler tastes of your youth could help your current financial situation. Doing this can help you feel better about your life as well as save more money. What do you think? Is it now easier for you to save than it was a few years ago? 14 Responses to Does Saving Get Easier As You Get Older? Savings has definitely gotten easier as I’ve gotten older. I know for me, it’s thanks to the fact that I both earn more now AND want for a whole lot less. Good combination! I think a lot of what’s contributing to the young being poorer is how difficult it’s been to enter the workforce the past 5 years. People are spending a lot more time in unpaid internships and very low paying positions just to build a resume while looking for something better. For us, the old adage “With age comes wisdom” applies. Whereas we used be eager to fill our house with stuff, we’d now rather have a good looking balance sheet, and the occasional fine meal. We’re in our mid-forties, and all of the “stuff” just doesn’t matter to us now. I have found it gets much easier to save as you get older. There are only a certain amount of standard items you need to buy (House, Fridge, TV, etc…) so as long as you don’t get sucked in by the adverts to buy the latest and greatest upgrade of the things you already have, you should find yourself with a lot more spare cash. Not to mention wages generally increasing, etc. I don’t currently have children but I don’t think they’d make much impact on our current budget, because things like going out with friends will no doubt get replaced by staying in and spending quality time with the kids, so I’m sorry but I don’t buy that argument either. A very good question, Robert. My answer will be – depends (and no, I’m not an economist :)). My experience is – and I am in my early 50s – that age on its own is not a factor. Four years ago we had close to £2,000 negative cash flow which is not very good for saving (we also had an obsenely large consuler debt). Once I woke up (financially) we turn the situation around within months and from this negative cash flow we were in a position to pay off debts (we paid it off in three years) and now have over £2,000 positive cash flow. Was it age? Heck no! It was me getting fed up and deciding to learn and act. Life also is not cheaper the older you get. When I was young I thought it is an injustice that older people earn so much more when they don’t want to spend on night clubs and fun. Now I spend much more on my hair, my teeth, my choropedist…you name it. Within a decade I’d expect to be spending most of my income on medical stuff (the NHS will be gone within five to ten years) rather than mototbikes and the theater. This is life! Thanks for the interesting story Maria. Personally, I have found saving both easy and difficult at different stages of my life, so I probably agree that it depends on a number of factors. Saving has definitely become easier for me as I’ve gotten older. My earnings haven’t really increased, but I definitely want less stuff. I’ve eradicated some expensive desires and habits from my life that I used to think were making me happy (but weren’t in the end).